It is Christmas, and Christmas is much about giving. 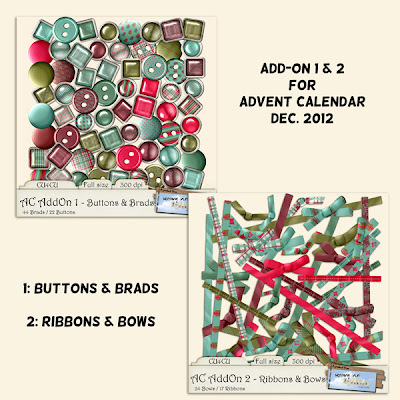 Therefore, as promised, I here give you not one but two Add-Ons to the Advent Calendar. One filled with Buttons & Brads and one with Ribbons & Bows. All matching the colours of Day 24's Country Christmas Kit. 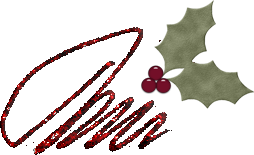 Enjoy the last (official) day of Christmas and then start planning for the New Year. I'll try to get back to you before New Year's Eve - see you then. Thank you very much for all the wonderful gifts! fantastic! thank you so much! Hope you had a wonderful Christmas! Thank you so much for your generousity! Your Country Christmas kit is wonderful. I just discovered your site, and I LOVE IT! You do wonderful work. Thank you so much for making all your hard work available for free for us digital scrapbookers! I cannot thank you enough. You make beautiful things! Thank you so very much for all your gifts all year long dear Trine! May all your wishes com true in 2013.